The LightCaster AnyFi™ is a USB-rechargeable, battery-powered, wireless DMX transceiver that is capable of transmitting or receiving either ultra-stable, Wireless Solutions AB™ W-DMX 2.4 GHz ISM (AFHSS) wireless DMX signals, or Blizzard Lighting’s own Skywire™ 2.4 GHz band frequencies. 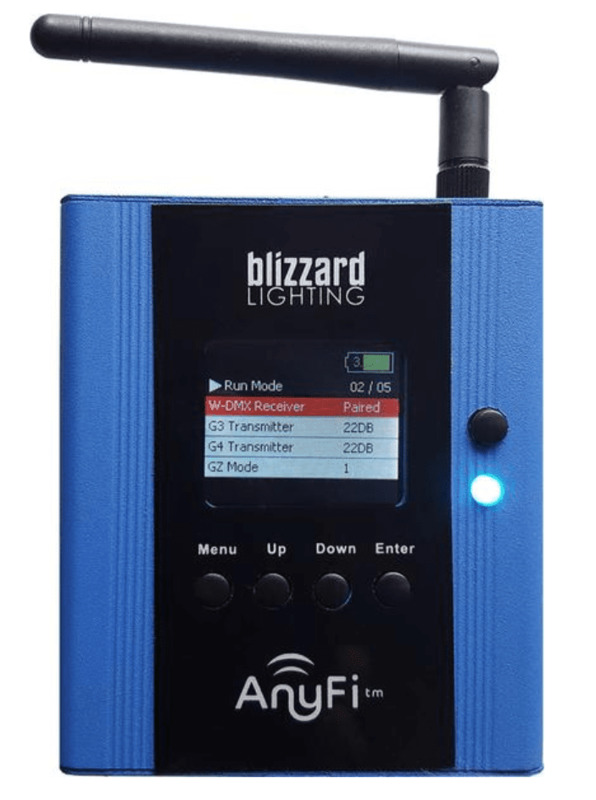 It will sync up perfectly to any Blizzard wiCICLE™ or Skywire™ (7CH) enabled products, plus, there is an additional Skywire™ 6-channel mode that will sync up flawlessly with other AnyFi™ enabled products using this mode. Skywire™ (6CH) mode is found exclusively in Blizzard Lighting AnyFi™ brand products. Its user-friendly operation simplifies all the complex communication protocols, and it features an easy-to-use 4-button TFT display menu interface. When using W-DMX®, users can leave any worries behind concerning loss of signal due to its built-in FHSS technology (Frequency Hopping Spread Spectrum). An unlimited number of receivers can be controlled by each transceiver, each one able to control 512 channels of DMX (1 universe).